In my last post, I mentioned the launch of an outdoor ad by Stella Artois Cidre which is powered by a weather detecting device that triggers the ad when temperature rises. Targeted advertising does in a way, ‘instill need’ for the audience at a more effective pace as compared to traditional advertising. 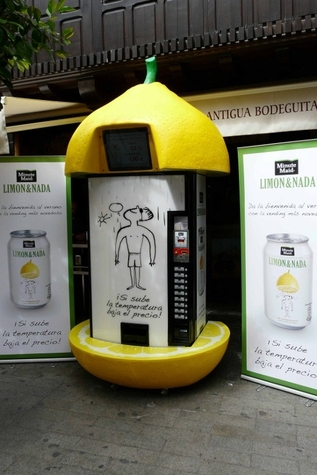 Minute Maid lemonade brand Limon Y Nada just did a promotion with a really awesome idea that allows consumers to purchase the beverage at a lower cost depending on the weather conditions. Giving away discounts is a good way to bring in crowds. The creative idea packs both price points and climate conditions together, giving the ultimate ‘thought’ package to the consumers. Imagine this: the weather is hot and you really need a beverage. You go to the supermarket, and you realize there a couple of drinks on the rack. You then compare them on their price tags, flavors and brand integrity. And then you realize that the price for Minute Maid has gone down. What does it show? It could come across that the brand actually cares. It would also bring about the habit of shopping for the same brand every time the weather turns hot. This would effectively instill the mentality for someone to purchase the advertised drink even though it might be slightly more expensive than the rest on the shelves. Momentum Madrid, installed 18 vending machines in water and theme parks all over Spain and plans to offer those drinks at a lesser cost whenever the temperature goes up. As I mentioned earlier, this is definitely one way targeted advertising would prove to be even more effective now that it is not only positioning its need at the correct time and location, it also instills and builds a new set of consumer behavior at the same time.